Dave Reeves of Lansing, Kansas, is a regular contributor to the Finesse News Network, and he recently posted a brief about a Japanese tackle company called Hayabusa. Reeves noted that they manufacture some interesting finesse jigs that might appeal to some practitioners of Midwest finesse tactics. One of them is the Hayabusa Brush Easy Head, which features a twin or double brush guard that is constructed with heavy-duty monofilament. According to Hayabusa, this brush guard deflects snags but does not adversely affect an angler's ability to set the hook into his quarry's jaw. It also works well around aquatic vegetation. The collar of the jig is endowed with two sharp barbs, which keep a soft-plastic bait affixed snuggly to the head of the jig. The size of the hook is a No. 1. It features Hayabusa's Original Hook Point, which allows the hook to penetrate quickly and deeply into the flesh of a bass' mouth. It is available in what Hayabusa calls a mud-black hue. It is, also, available in three sizes: 1/13-ounce, 1/16-ounce and 1/20-ounce. A package of four can be purchased for $4.99. 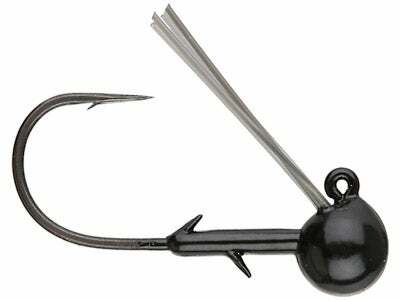 Besides the Brush Easy Head, some Midwest finesse anglers might be interested in Hayabusa's Little Shaker Wacky Head. It features a unique head design and short shank V-Bend hook. As the jig and wacky worm fall towards the bottom, they exhibit an unique and provocative action. When an angler imparts action to a worm that is affixed to the Little Shaker Wacky Head by shaking the rod, the design of the jig allows an angler to control the action of the wacky worm more effectively than can be achieved on other styles of wacky jigs, says the folks at Hayabusa. The hook is emblazoned with Hayabusa's Original Hook Point, and its V-bend helps to prevent largemouth and smallmouth bass from tossing the jig-and-wacky-worm combo once the hook has penetrated the flesh of a bass' mouth. It available in three sizes: 1/13-ounce, 1/16-ounce and 1/20-ounce. A package of four can be purchased for $3.99.